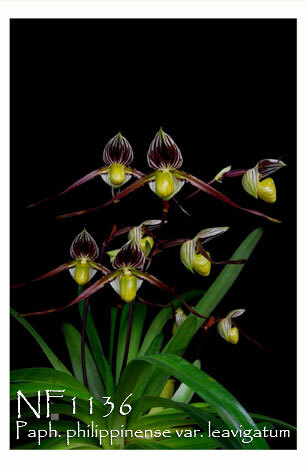 A rare color form of one of our favorite of all Paph. species ! Endemic to the Philippines and northern Borneo, this hot growing species is found on limestone outcroppings from sea level to about 500 meters in elevation. A larger grower, it can produce up to five flowers per compact inflorescence with the dramatic contrast of yellow-green pouches against the darker sepal and petals. Very Highly Recommended !